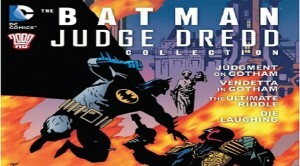 The Batman & Judge Dredd Collection could well be the most essential compilation for any comic fan this holiday season.Taking the original comic books created between 1991 and 1998 DC and 2000AD are bringing together these unique cross-over stories together in one tastily bound hard back book. This will put together each of the individual stories featuring the best of Batman and the best of the law maker himself, Judge Dredd. The Batman & Judge Dredd Collection will release on 27th November 2012 with a price of £16.99 in the UK, $22.99 in the US and $35 in Canada. 2000 AD is very proud to be working with DC Comics to co-publish the highly anticipated THE BATMAN JUDGE DREDD COLLECTION, which brings together the four team-ups between the Lawman of the Future and the Dark Knight for the first time in a brand new hardback edition, with a fantastic roster of superstar talent, including Simon Bisley and Glenn Fabry. Originally released between 1991 and 1998, these epic crossovers – Judgment on Gotham, Vendetta in Gotham, The Ultimate Riddle, and Die Laughing – brought the dynamic duo together to fight their ultimate foes. 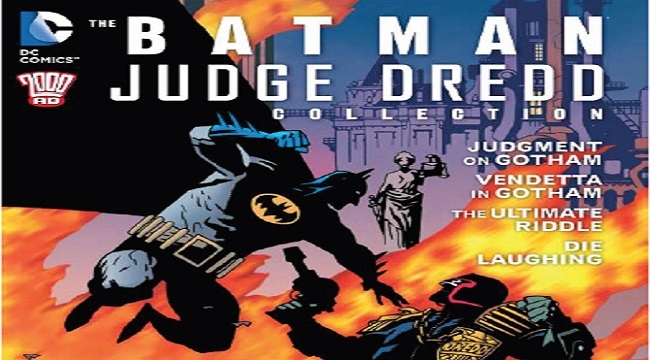 From alien super-fiend Judge Death escaping to Gotham to the Joker teaming up with the Dark Judges to cause mass slaughter in Mega-City One, THE BATMAN JUDGE DREDD COLLECTION brilliantly captures the lunacy and non-stop action of these two all-too-similar worlds from either side of the Atlantic. Judge Dredd co-creator John Wagner leads a pack of top names, including Alan Grant (Batman, Lobo), Simon Bisley (Hellblazer), Glenn Fabry (Preacher, Hellblazer), Val Semeiks (The Demon, Lobo), and Cam Kennedy (Batman, The Light and Darkness War) – all contained in a cover from Hellboy creator Mike Mignola. Published by 2000 AD in the UK and Ireland, and by DC in North America, this ultimate new edition also includes the hard-to-find meeting between Dredd and psychotic biker Lobo, and deserves a place in the collection of any self-respecting Dredd or Batman fan.